Update: The scoped-properties directory in language packages is now named settings. See the master branch of the language-gfm and language-python packages for the latest examples. 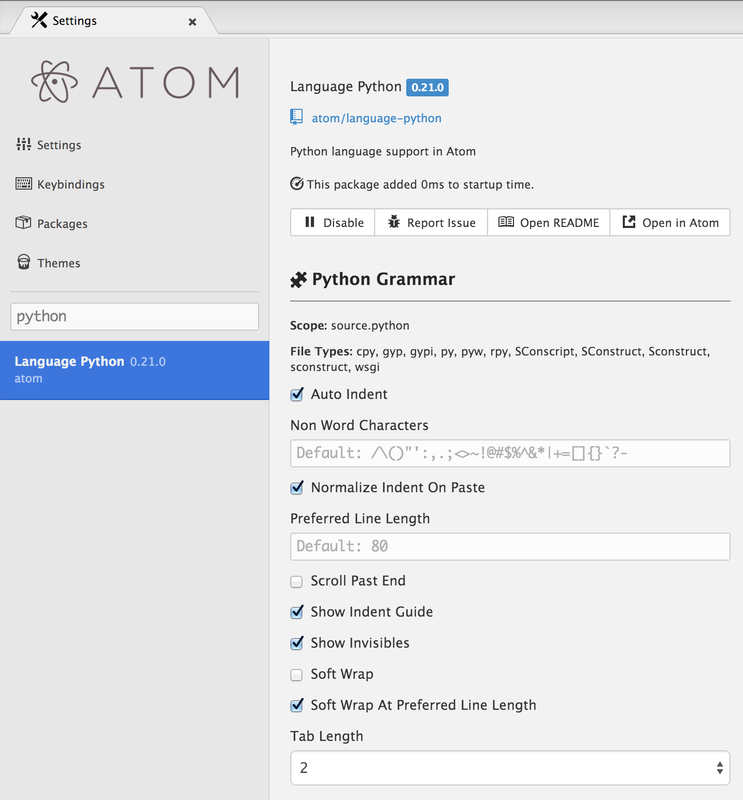 Previously Atom had no way to set language-specific configuration settings without a package. Language-specific settings are now built in . For example, you may want Atom to soft wrap markdown files, have two-space tabs for ruby files, and four-space tabs for python files. Now you can edit these config settings in the settings view on a per-language basis. Just search for the language of your choice in the left panel, select it, and edit away! Open your config file via the command palette (cmd-shift-p or ctrl-shift-p for windows / linux), type open config, and hit enter. Global settings are now under a global key, and each language can have its own top-level key. This key is the language’s scope. Language-specific settings override anything set in the global section. You can use scoped settings in your own packages. Config::get now accepts a scopeDescriptor and Config::set accepts a scopeSelector. See the the scopes docs to learn more about scopes. The simplest way to implement language specific settings is to get your setting with the language scope descriptor — the editor’s root scope descriptor. # Falls back to a global value if no language specific value is defined. You can watch for changes on a given keyPath for a scope with Config::observe. When watching for changes to a config setting for a given scope, you should take grammar changes into account. # re-observe the setting when the grammar is changed. A language grammar can provide language-specific defaults. For example, the Markdown grammar now defaults editor.softWrap to true in its scoped-properties file, and Python now has a default tab length of 4. We hope this improves the editing experience to all of you who regularly use a variety of languages!